In 1930s Munich, danger lurks behind dark corners, and secrets are buried deep within the city. But Gretchen Müller, who grew up in the National Socialist Party under the wing of her "uncle" Dolf, has been shielded from that side of society ever since her father traded his life for Dolf's, and Gretchen is his favorite, his pet. Uncle Dolf is none other than Adolf Hitler. And Gretchen follows his every command. Until she meets a fearless and handsome young Jewish reporter named Daniel Cohen. Gretchen should despise Daniel, yet she can't stop herself from listening to his story: that her father, the adored Nazi martyr, was actually murdered by an unknown comrade. She also can't help the fierce attraction brewing between them, despite everything she's been taught to believe about Jews. In the past, I’ve found myself feeling not-so-positive about novels that have characters or situations that scare me. In fact, even real life stories about the world wars and revolutions scare me. And yet, there’s something infinitely fascinating about studying human actions in the past, trying to see how and why these things that are so drastic and terrible occurred in real life. What does this have to do with Prisoner of Night and Fog? Well, author Anne Blankman offers a fresh perspective on a historical period both terrifying and fascinating, showing readers what it was like for Nazis and non-Nazis. But even more interesting is the portrayal of Hitler, which ranges from a doting uncle & family friend, to a man prone to indulging his whims, to the terrifyingly prejudiced mind behind a whole movement. Even though it scared me, reading about him in this novel was definitely interesting! Gretchen, the main character, is a great choice to narrate this story. As a teenager, she is caught between the naïve trust of a child and the stubbornness of an adult’s personal opinions. She’s known all her life that her father died to save Hitler, and “Uncle Adolf” has always been kind to their family as a result of that heroism. While she’s not comfortable with some of the things that happen to Jews, she often feels powerless to stop it without risking her family and her life. Putting a person whose mind and beliefs are still being solidified in such a tricky place is definitely a potent mix for a story. Observing her growth, especially as she discovers truths about Hitler, her family and herself, is another compelling part of Prisoner of Night and Fog. She teams up with a boy named Daniel, a reporter who is determined to uncover the truth about things (including the death of her father and the other men “for” Hitler). He’s an interesting fellow, with many connections and an attitude that made me like him immediately. Though he often wound up in risky situations (and took Gretchen with him), he genuinely wanted to know the truth and do the right thing by it. 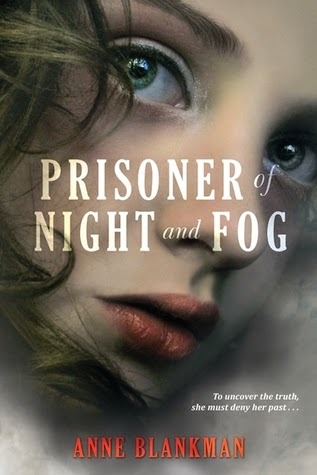 Prisoner of Night and Fog combines history + a teenager growing up + a bit of a mystery into one pretty neat package. While there were certainly things I found disturbing and scary (well, mostly just Hitler, who happens to be a terrifying human being in my eyes), it was just so absorbing that I couldn’t tear my eyes away. If you’re into historical fiction, this is definitely a prime example of it in YA. This one sounds soooo good. I love historical fiction and the concept behind Prisoner is killer. My co-blogger, Mari, read it too and she's been raving about it, so this is definitely one I would want to read. Nice warning about the disturbing stuff though. I'm not usually bothered about that kind of thing, but it's always nice to know. I've been wondering whether or not I should pick this one up, so I'm so glad you reviewed it! I think Hitler is terrifying too. I haven't picked this up yet, but I was really hoping to read it. It looks and sounds amazing. Thanks the great review! So glad you loved this Alexa! It's one of my favorites this year. Such a disturbing, sad time in our history, and it's definitely unsettling to read about here. All the scenes with Hitler had me so uncomfortable, and I was terrified for Gretchen and Daniel. I didn't think historical YA could be so thrilling, but this one had me hooked. Can't wait for the sequel! I loved seeing this side of Hitler. The contrast between all the things we know about him and seeing him as an Uncle was fascinating and well-done. I liked Gretchen and her growing relationship with Daniel, although I hope to see more development in both of them in the sequel.